Blink and you might miss Will Honas. He’d prefer it that way. The linebacker only wants you to know he’s there once he hits you. On  Nov. 4, 2017, that's exactly what happened. If you’re a fan of  Netflix's Emmy-nominated series "Last Chance U,” you’ve already seen Honas in action. You may not have known it while watching Episode 7 of the third season –– appropriately titled ‘Abracadabra’ –– but Honas was there in his purple No. 2 jersey rushing the Independence Community College quarterback every chance he got. So much so, even the former Independence quarterbacks coach Frank Diaz remembers Honas by number alone. Honas joined the Nebraska football team in January after spending two seasons at Butler Community College in El Dorado, Kansas. He finished the 2017 season with 96 total tackles (48 solo), three sacks and two interceptions (returning one for a touchdown). He left little question as to why he was considered one of the nation’s best junior college linebackers. Yet, he doesn’t really remember much about that game against Independence. He was so focused on his own performance that he hardly noticed any of the drama unfolding on the other sideline. No. 10 Butler hosted No. 5 Independence  that early-November night. The Pirates –– just renewed as the featured program for another season of the popular show  –– needed the win over Butler to clinch an outright conference championship. It would have been the first conference title for Independence in 30 years. Spoiler alert: Butler won 31-27. That’s when the drama began. Independence’s sideline was already on edge, but the loss put a match to the fire. Curse words flew. Helmets were slammed into the ground. Coaches, like Diaz, tried to remain calm as players yelled at them in frustration. There’s a reason Netflix allowed the moment to play out just a little longer on screen, focusing on the players as they unraveled. It was a spectacle. A side of junior college he had never seen or experienced firsthand, it was fascinating for Honas to watch it play out on his TV. Especially because he would have never assumed that's  what was happening just across the field that November night. Nebraska defensive coordinator Erik  Chinander  isn’t surprised Honas has no memory of the drama that unfolded on the Independence sideline. He’s one of a handful of players  Chinander  can trust to be fully engaged in the game. He’s also not surprised Diaz remembers him. Honas is a player you game plan for. It’s the only way to stop him, and even then it might not be enough. As Chinander sees it, there are two types of players that stand out to opposing coaches. “It’s the guy that’s  whooping  and hollering all the time, whether he’s making plays or not,” Chinander said. “He may be remembered  good or  may be remembered bad. Chinander  has experience coaching junior college athletes. He spent  the 2003  season, his first as a coach,  as the offensive and defensive line coach for Ellsworth Community College in Iowa Falls, Iowa. He’s seen all kinds of players during the course of  his career, so he's confident that  there’s something special about Honas. “He’s constantly, constantly, constantly making plays,”  Chinander  said. “He’s in the  backfield. He’s running sideline-to-sideline. He’s just a guy that you remember the effort." Nebraska running backs coach Ryan Held provides feedback during a drill. Running backs coach Ryan  Held agrees. Having made a name for himself coaching at the junior college, Division II and NAIA levels,  Held's  also  seen  it all when it comes to the young men in his programs. He’s also heard it all. A common misperception Held has dealt with is the idea that every junior college athlete isn’t smart. They have low ACT scores, and education has never been –– and never will be –– a priority. “Which is  completely false,” Held said. “I can tell you that there was an element of kids that didn’t make it academically that needed junior college to be able to be eligible. Maybe that’s  why so many junior college athletes take fans by surprise when they arrive at Division I programs. It was never about their ability to be successful. It was about finding the right opportunity. Held wears a small black rubber bracelet on his right wrist. The message is simple. Having  coached many of the young men seeking Division I offers,  it’s personal for Held. Seeing the players that he coached succeed at new programs –– or in any walk of life –– is why Held got into coaching in first place. It’s a point of pride for Held, who can rattle off player after player and how they’re doing today. Knowing the work that went into their success makes it that much sweeter. It’s also why he connects so well with junior college coaches and athletes. He  understands  their world. Chinander sees moving from the junior college level to the Division I level as “going from being broke to  being  a millionaire." Chinander sees moving from the junior college level to the Division I level as “going from being broke to  being  a millionaire.” It’s a difference in training facilities, meal plans, gear, supplements, film availability, coaching and academic support. That can make all the difference in the success of any athlete. That journey is why Held continues to wear that black rubber bracelet. It’s a reminder of where he’s been, and where he is now. “Last Chance U” has brought the struggle of junior college programs into the homes of anyone with a Netflix account. Fans have watched –– and cringed –– through the ups and the downs at both East Mississippi Community College (seasons one and two) and Independence (season three). The show has even found its way to the TVs and computers of Nebraska’s coaches and staff. That doesn’t mean they’re all on the same page with the show. “I honestly probably won’t watch that,” Held said. “Being a JUCO guy, it is what it  is  but I probably won’t put myself in the position. I’ve heard about it and I’ve seen a little about it. I mean, JUCO football is a grind. It’s tough love and I wouldn’t change it for the world." Held’s  hesitation with the show is the “reality” aspect of it. He’s not suggesting the show isn’t real, but he also knows the show’s producers are seeking storylines and certain situations to highlight. It wouldn’t be as  interesting of a TV show if they didn’t, and he can understand why people tune in. It’s the reason people stop Nebraska wide receiver Mike Williams when he wears his East Mississippi jacket on campus. “Is that the ‘Last Chance U’ school?” he’s frequently asked. Williams wasn’t there for either of the two seasons that were filmed at East Mississippi –– it had moved to Independence by the time he arrived in Scooba ––  but it hasn’t stopped the questions. He doesn’t mind, but he also won’t lie about his reason for ending up on coach Buddy Stephens’ team. Williams and Honas are two of eight former junior college athletes on Nebraska’s current roster. Now that they’re in Lincoln, each player is just thankful for the opportunity. Nebraska is everything they dreamed  of. Will Honas (No. 3) walks off the field at Nebraska's spring game. Honas isn’t one to smile too big during an interview, but he'll crack one from time-to-time. 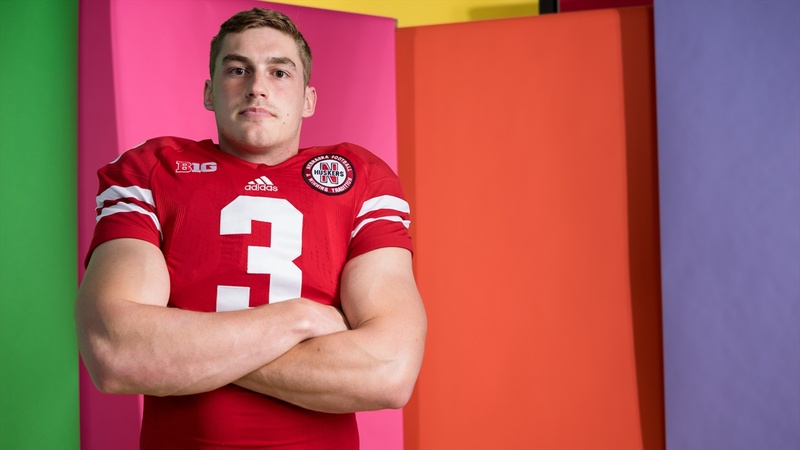 And on the fourth practice of Nebraska’s fall camp, a sly smile snuck across his face when he thought back to that game against Independence last November. Teams were targeting him by  that point in the season, so his tackles were harder to come by. But he’s there during Episode 7, in nearly every scene when the Butler defense takes the field. And he's there at the end. As Butler leaves the field after the win, Honas appears for  a moment  looking back at the camera.